Product #60839 | SKU XSW-D PEDALBOARD SET | 0.0 (no ratings yet) Thanks for your rating! A deposit of $65.00 is required for this pre-order. The Sennheiser XSW-D PEDALBOARD SET is a gig-ready, low-latency, wireless guitar system that's as easy to use as a guitar cable, while still providing the freedom of digital wireless. The XSW-D puts world-renowned Sennheiser sound quality into a plug-and-play, 1-button digital system that anyone can operate. Plug it in, power it up, and you're immediately up and playing, simplifying your setup so you can concentrate on performing with confidence. The XSW-D PEDALBOARD SET comes with a miniaturised 1/4" plug-on instrument transmitter. The pedalboard receiver includes a built-in tuner and direct box, which add versatility to your rig, while saving valuable space. The system connects to any guitar/bass amplifier, pedal, stage box, or mixing board, capturing the full range of your instrument without compromising your tone—on stage, at home, or in rehearsals. The exceptionally lightweight and low-profile 1/4" plug-on transmitter plugs directly into the output on your guitar or instrument. For a less obtrusive appearance, you can use the included belt clip and extension cable to attach the transmitter to your waist or strap. The extension cable can also be used when the transmitter doesn't fit in a specific instrument. The compact pedalboard receiver features a 1/4" instrument output to connect to your amplifier or pedal, as well as a DI output on a balanced XLR connection. There is also an onboard tuner with an LED display for visual confirmation, and a footswitch to mute your instrument when tuning. You're ready to turn it on and play—it's that easy. Sennheiser wireless systems are an industry standard, prised by professionals for their clarity and reliability. 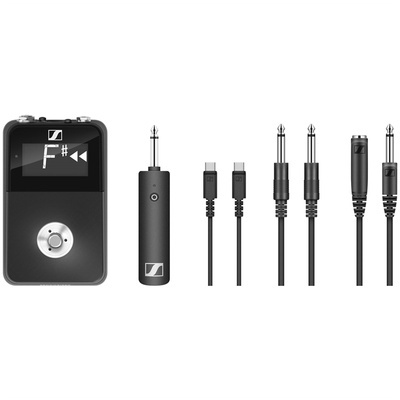 The XSW-D system allows first-time and budget-conscious users to get their hands on genuine Sennheiser sound quality without breaking the bank. Analogue wireless systems need to squash your signal to operate in the FM band, resulting in a thin sound with a high noise floor. The XSW-D uses digital technology to preserve the dynamic range of your signal and deliver a crisp, clean, guitar sound with all the nuances of your performance. On stage, timing is critical, and the XSW-D uses the aptX Live codec to deliver an impressively low latency of 3.9ms, so you don't experience any lag when playing—keeping you on point and in the groove. Nothing ruins a take like hearing the weather report coming through your amp. Unlike traditional analogue wireless systems, the XSW-D digital system operates in the 2.4 GHz ISM band, protecting the integrity of your signal from interruptions and dropouts caused by TV channels, radios, or other sources. The functionality of this XSW-D PEDALBOARD SET can easily be expanded by adding XSW-D Series transmitters and receivers, as your needs evolve. With this set, adding the XSW-D 1/4" plug-on receiver gives you a streamlined option without the tuner and DI, which plugs directly into your amp (or pedal). If your band wants to go wireless, up to five musicians can each use an XSW-D system on the same stage. Simply let the system pick a channel for you and start recording, whether you're working at home or anywhere in the world.